A smart phone that has emerged with very smart features to mesmerise and woo you is New Acer neo Touch P400. It offers you all the features that you were looking for since long, it is slim as much as 12mm in thickness with amazing black and chrome finish curvature and there is also high-definition (HVGA) touch screen of 3.2 inch. 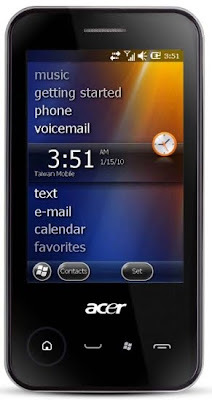 New Acer neo Touch P400 is gifted with Windows Mobile 6.5.3 OS supported by optimized touch control system. To facilitate business operations, it offers Microsoft Exchange Server Support,Mail, Windows Media Player 10, Microsoft Office Mobile applications, 3G and WiFi connectivity as well. What else do you want in a phone it has everything. Moreover its internal memory is 256 MB RAM with micro SD card with extensible memory of 512 MB ROM. 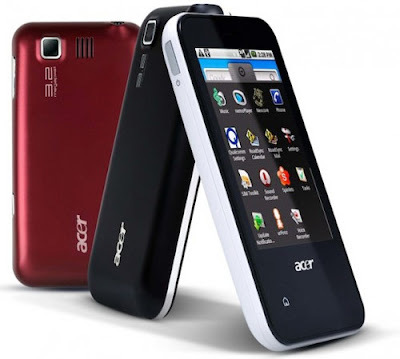 New Acer neo Touch P400 has Standard battery, Li-Po 1090 mAh Standard battery, Li-Po 1090 mAh. To capture each and every moment of your pleasure it has a wonderful camera 3.2MP with autofocus and geo-tagging capabilities. New Acer neoTouch P400 comes with 3.5mm audio jack for quality sound for your ultimate fun along with alert options like MP3, WAV ringtones,vibration and downloadable polyphonic. It has an automatic wireless and web-based synchronization with owner’s laptop such an intelligent phone alongwith global roaming (850/900/1800/1900 MHz) and UMTS tri-band global 3G (2100/1900/850 Mhz) network connectivity.